Across SyncroBo and MogTug, we have iterated different sleeping accommodations. In SyncroBo we had two bunks, but both required a bit of effort to set up. Since the bottom bunk was also our back seat and storage space, we needed to use the front seats for storage at bedtime. But overall it was a fast process and we could be ready for bed or ready to move in about 15 minutes. With MogTug we were excited about the possibility of a permanent bunk option. A sleeping area that was always ready for a nap. But when you start trying to figure out how to do that in 96 square feet it becomes challenging. A sleeping platform could easily be 24 square feet. 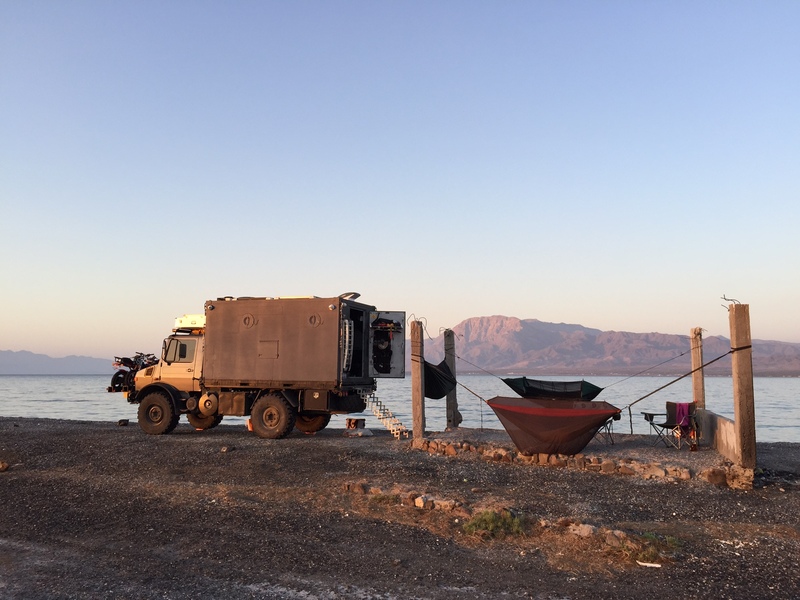 So we sprung for what we thought was the next best option, a rooftop tent. We went with an ARB Simpson III over the cab and ordered an additional ladder section to deal with the approximately 10 foot height. We thought this would be perfect, but alas it was not. You can read why here. But now we think we have found the best option for us in hammocks! We started “hanging” with a simple ENO Double Nest, and it is an awesome lounging hammock and great for a nap every now and then. This got us hooked. We started researching and reading about hammock camping and the people who were using hammocks as their outdoor accommodations in all weather types. This opened our eyes to an entirely new world of options beyond ENO. 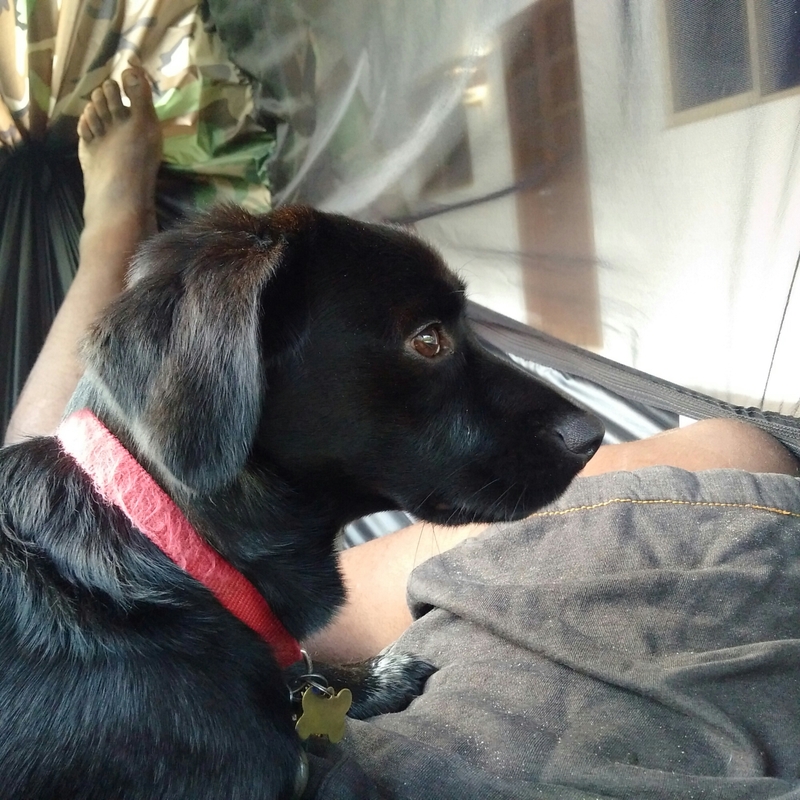 One of the big downside to a basic hammock is the lack of bug protection. The ENO was great during the day but as soon as the biters arrive, we would have to run indoors. When you step up to purpose built camping hammocks, they come with netting for bug protection and often tarps for rain and wind protection. We decided to ditch the roof top tent and go for two camping hammocks, knowing we always have the option to sleep inside MogTug if we need to. I went with a Clark NX-270 and Pat with Hennessey ASYM. These hammocks both come as “complete” shelters including hammock, bug net, tarp, storage bag and ropes to tie the hammock up. Let me make this simple. Our hammocks have provided us with the best sleep of any of the options we have tried on the road. Once you learn to hang them with the right amount of slack, it’s amazing. You look at them and you wouldn’t think that could be comfortable, but the secret is that you lay on a diagonal in the hammock and you essentially are able to lay flat. With the bug netting in place it’s a great spot to stargaze and enjoy a night time breeze. Sometimes even Syncro joins the fun. The hammocks set up quickly and in less time than the roof top tent or popping the top and moving everything in SyncroBo, and they tear down just as fast. They also pack down really well and take up practically no space. They have become our beloved cocoons of comfort. They also give us additional “rooms” to our tiny house, and are a great way to accommodate additional guests on the road. Right now we can sleep 6 with everyone having their own bed :). Well, you need some type of structure to hang them. We often us the truck as one side of the equation as the box has very useful lifting rings on all four corners that serve as perfect anchor points. So most of the time we only need to find one or two additional anchor points. For the most part we haven’t had an issue finding trees or posts to hang from, except on the beach at times. 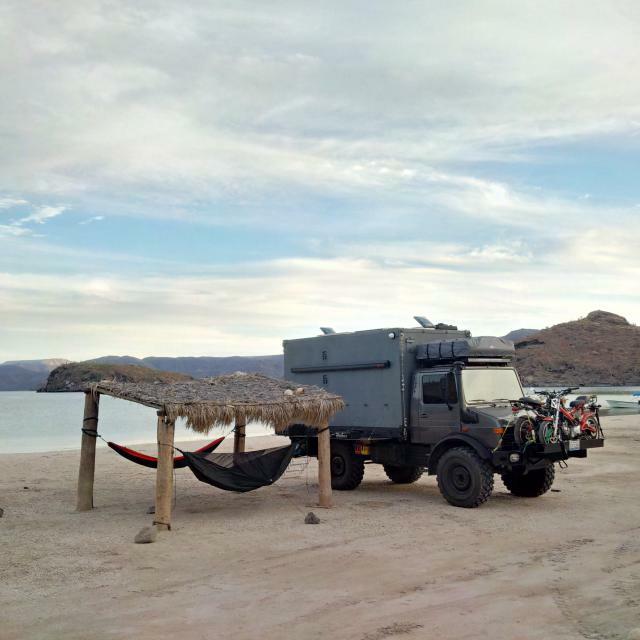 In Baja there were some spots where we couldn’t find trees and in those cases we slept inside. But over time we find that we are looking for shade anyway for the truck and Syncro, and with shade comes structure. I would say 95 percent of the time we are good, even including beach time. The bigger challenge with hammocks is staying warm when the temperature drops. Because you are hanging in the air with your back exposed to the air (vs your mattress or the ground), air passing under you, takes away heat via convection. In hot weather, this is awesome because the hammocks are often the coolest place to be (pun intended), but once the temp drops beyond 65 degrees, it can start to feel cold. The simply solution is to wrap up In a blanket or sleeping bag and that takes care of it to about 55 or so. To go lower than that, it’s time to invest in an underquilt. This is a quilt that goes under your hammock to insulate you from the outside. With one of these in place, it’s comfortable from 65 down to 35 or so in t-shirt and shorts. Outside of those two points, we can’t see any downside to the hammocks and a ton of upside. Even if you don’t spring for a fully kitted camping hammock, having a simple hammock you can string up at camp would be a great investment for any overlander. Great article! How are you guys?